Recently, two bucks and a doe were frolicking around in the fields of Cades Cove, Tennessee. But, rut season was near and these bucks were gently testing each other by locking antlers. 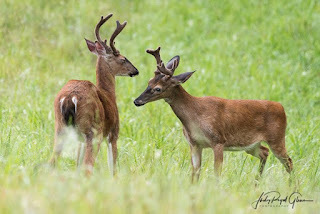 One buck firmly stated, “I’m the leader!” The other buck pulled back and concurred. 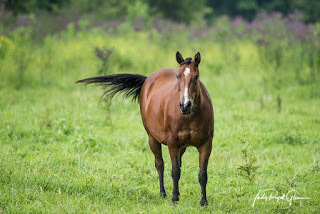 I love watching the horses in the fields of Cades Cove, Tennessee. The ironweed made the sight even more beautiful. Not until I got home did I notice the beggar’s-lice tangled in his mane. It gave him a nice hairdo. A friend of mine from Tennessee invited me to stay at her house. When in Tennessee, the must thing to do is to go to Cades Cove in the Great Smoky Mountains National Park! 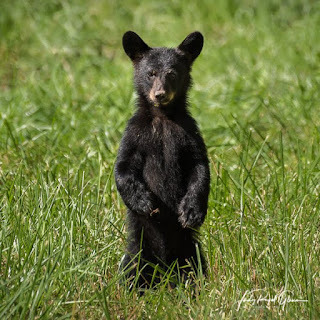 This little black bear cub was foraging with his two siblings and momma bear in a field. He was causing quite a stir amongst the visitors. He stood up on his hind legs wondering what’s all the fuss? 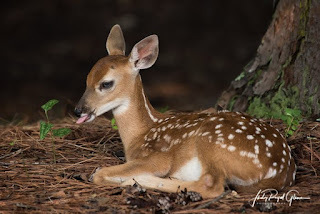 For some strange reason, when I look at this photograph, it reminds me of Elmer Fudd saying, “Shhh! 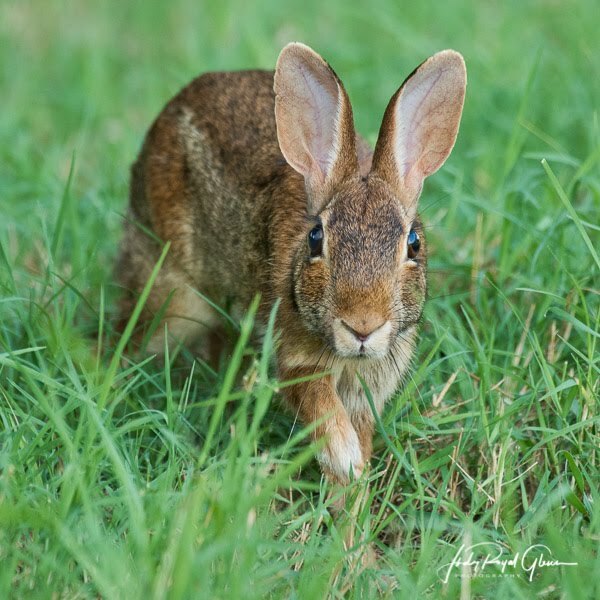 Be vewy, vewy quiet, I’m hunting wabbits.” There is one exception—I would not hunt rabbits. This little fellow was not far from my camera, and he felt comfortable enough to walk towards me. It kind of blew me away! I stopped by a friend’s house to chat with him and his wife one evening. The sun had already set, and we visited in the dim light of their front porch. 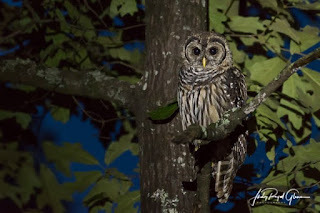 He told me a barred owl and its baby had visited the night before and sat in their trees as the "baby" called to its "mom." While I was standing there, he saw the owl fly to the same tree. It was super dark, and I could barely see the outline of the owl. I asked him if he had a high-powered flashlight. He rummaged through his house and then shone the light on him so I could photograph the owl. Intermittingly, its mom was on a branch over my car. Crunch! The two-foot limb she was sitting on fell unto my car. There was a major issue—the car was brand new, and I only had it a week. Thankfully, the branch was rotten and did not weigh much. It spared my windshield by a hair. A few small scratches now decorated my car, so I called out, “Stupid owl!” The owl was just paying me back for shining a light on her baby. I don't even like to use the word stupid. That's just what came out! 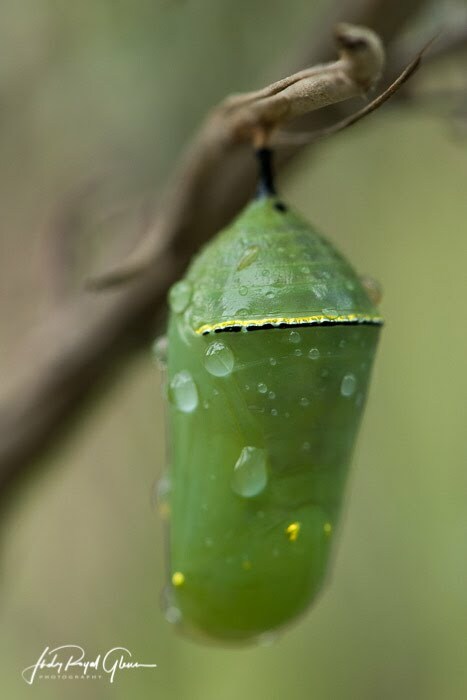 The chrysalis of the monarch butterfly is a sight to be seen. It is beautiful with exquisite yellow and black looking jewels near the top. After I spoke at the Friends First Friday group about hummingbirds and the Hummingbird Trail, I went on a treasure hunt. Shelly, the Director of Horticulture, told me there were three monarch caterpillars in a garden bed recently planted. I flagged down another curator and we hunted for the treasure but came up empty. Instead of looking for caterpillars, I started looking for chrysalises. B-I-N-G-O! Ma told this white-tailed fawn to eat his veggies but did not warn him about the thorns! I don't think he was really eating the plant but thought it made for a good story!